An online writing platform that allows users to easily post their creative writing and fan fiction for fun, feedback and fame. My team focused on improving the community space and the writing process. 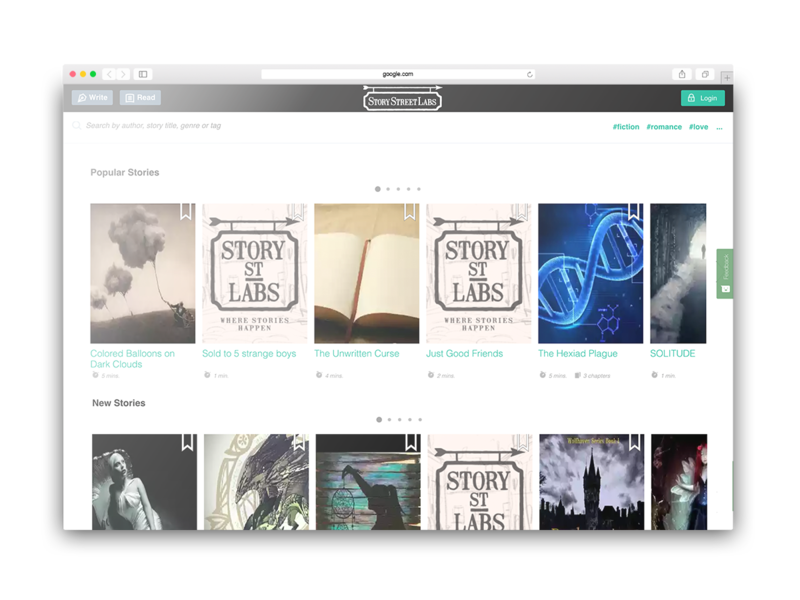 Story Street Labs is an online community for anyone to publish, share and read creative writing and fan fiction stories. 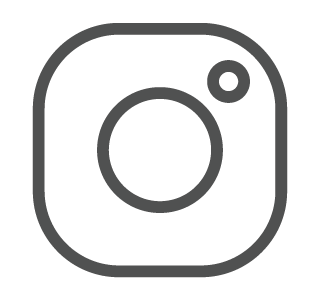 They believe every story posted on the site has the ability to positively impact someone’s life and they strive to reinvent the storytelling experience by being a welcoming and completely open community to all types of writers. They came to my team to help them explore ways to set themselves apart from all of the other online writing platforms by focusing on building a more robust community and adding value to the writing process. We started our kickoff meeting with Carlos, the client explaining to us what he thought his user’s frustrations, desires and challenges were. He began by mentioning he had conducted user research a year prior which allowed him to find a lot of touchpoints to address. During his prior research, he found that users were frustrated with the usability of certain features of the site specifically on the home page and writing screen. Carlos found his users were having a hard time locating the search bar and felt it was not the best way to sort stories. In addition, some of the icons were not visible to the users and only offering two rows of stories to explore was limiting. While the site prides itself on being an online community, the client also found that the majority of users wanted more of that element. They wanted the option to collaborate together in writing exercises such as role playing. Currently, the site only offered individual writing exercises. How can we improve the usability of the site? How can we encourage users to become more invested in the writing community? How do we incentivize users give feedback to increase engagement? How can we add value to the writing process? I wanted to know the basics of why people enjoy writing and what the benefits are. We found out that people write to express themselves. Whether it be to journal about an experience or to uncover suppressed feelings, people use writing as a way to get their feelings and thoughts out of their head and onto paper. People also write for the pure form of practice and repetition to help them improve their own writing and process. Next, I wanted to know more about the increasing popularity of fan fiction. I found that fanfiction is a growing community that has evolved positively over the years. There was once a stigma but it is now fading with the amount of fanfiction writers that are being published such as Twilight and 50 Shades of Grey. Finally, I wanted to explore the benefits of belonging to an online community. 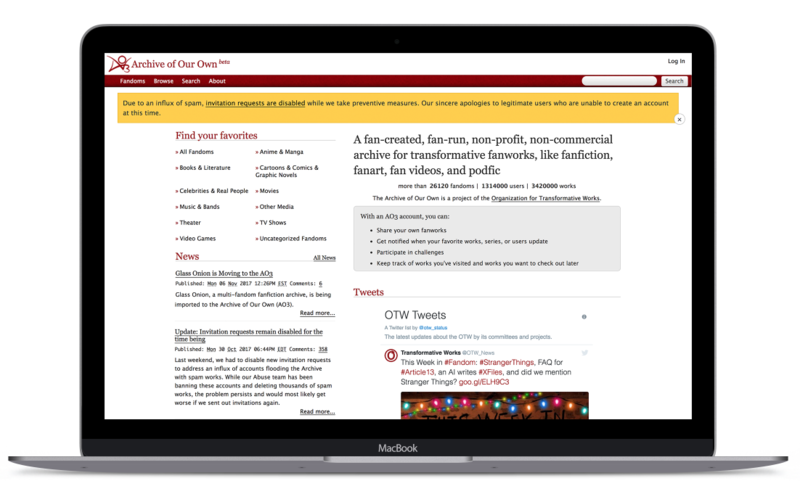 We discovered online writing communities offer a space for users to collaborate and support each other while gaining inspiration for new ideas for their own writing. It’s also a space to share and receive information such as tips, advice and feedback. -Requires an invitation. Not accessible to all. 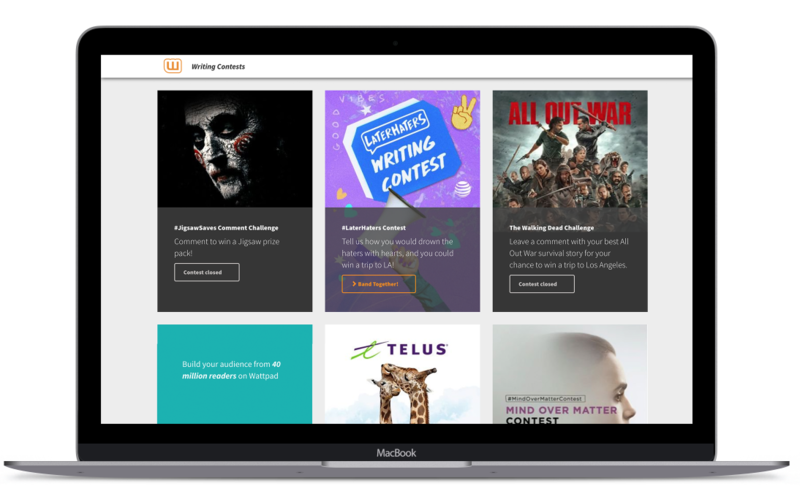 We found that Wattpad and Archive of Our Own are the go-to sites for writing fan fiction and short stories. Although they already have an established user base, the presence of community was still lacking. To gain a different perspective, we also looked at an indirect competitor, HitRecord, to see if there were any opportunities we could leverage. HitRecord provided a lot of insights on how to effectively engage and motivate users through a design challenge. They also inspired us to borrow familiar interactions and design patterns since they were so well received by the writing community. At this point, I discovered we didn’t need to reinvent the online writing concept. It already existed and a few of these competitors did it very well. Yet, there were still some opportunities and gaps we could leverage moving forward. Once I had a good grasp on the existing market, I wanted to hear from the actual and potential users. 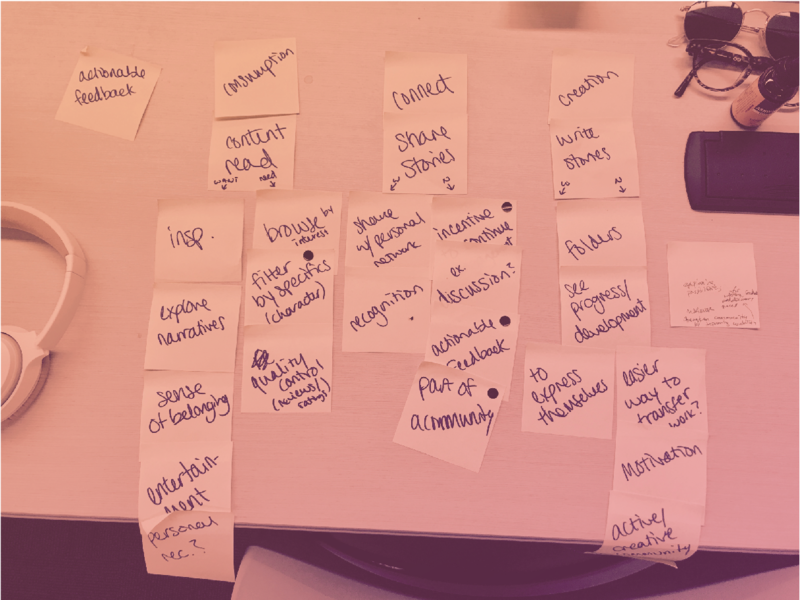 We kept the client’s interest in mind of focusing on the usability and community aspect, but we went into user research casting a wide net to discover all of the goals, needs, frustrations, and motivations of the target users for this product. We interviewed six users, ages 23-48, from various backgrounds. They included writing enthusiasts, students and professionals. To gain a more expert opinion on the matter, we interviewed one journalist and two published writers. In addition, we also did a brief usability test on the existing Story Street Labs site to validate the client’s concerns and gain feedback on features that worked and didn’t work. 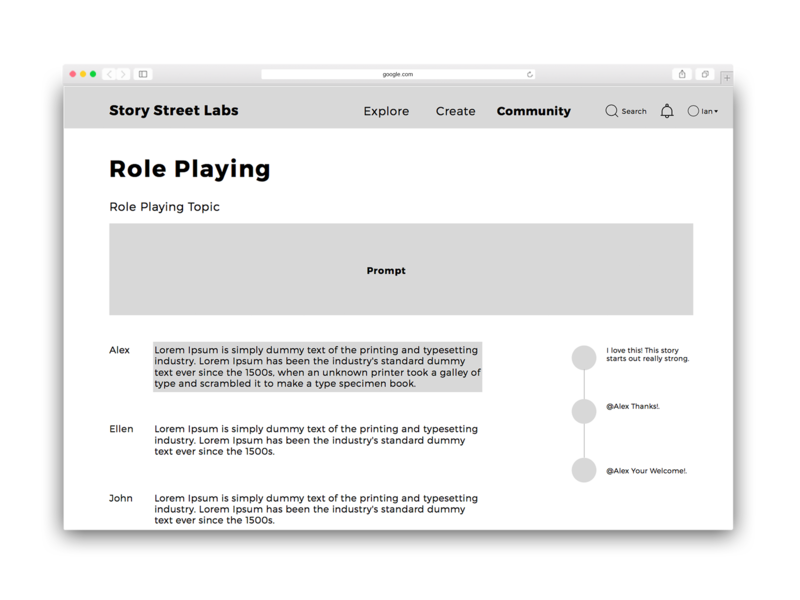 After we interviewed journalists, professional writers and writing hobbyists, we noticed one major group of users was missing: users of Story Street Lab. None of our initial interviewees were interested in writing creative works or fiction stories. Instead, they focused on writing non-fiction works on topics like marketing, politics and world events. This was a major constraint for us at first because we weren’t able to gain insights from actual users of the site. "I want to be friends with them, I find their social media stuff then say, ‘hey I read your story’ and say something nice." that the retention rate beyond one month was 2.4%. receive isn’t always what they need. specific actionable steps to improve their writing. what the users wanted to site be focused on. To round out our research, we used google analytics to investigate user engagement and found some business constraints. We discovered that user engagement was down in terms of liking, commenting and feedback. 74% of the user base from the site came directly from ads. We speculated the users that found Story Street Labs from ads already belonged to established writing communities and were curious to see what else existed out there. When they arrived at the site, they could not see the value upfront due to visibility issues and saw no reason to return back to the site. Overall, we found Story Street Lab’s competitors offered either high value or high usability but none offered both. 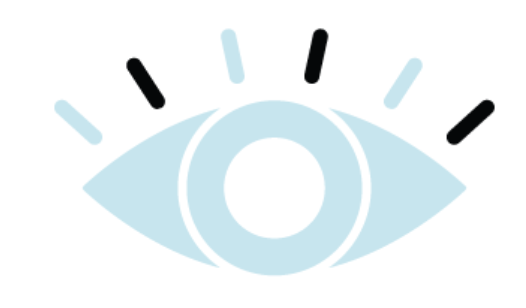 With this opportunity, I knew we needed to place emphasis on making sure the content and main features of the site were visible and showed meaning to the user. After we collected insights and data points, it was time to synthesize the information to begin to define the main problem users faced. At first, the problem was unclear. we took a step back to define what our main obstacle was and how to overcome it. We didn’t know exactly who we were solving for since the interviewees were very inconsistent in terms of background and desired genre. We revisited our interviews and decided that since our interview insights were mixed, we should approach the issue with a broader perspective. By doing so, we found that our focus didn’t actually have to be catered to one genre. Instead, we could expand and focus on all types of writing. With this new insight, we returned back to the drawing board to uncover our users’ primary wants and needs. We saw a few major trends emerge that centered around wanting a community to collaborate with and wanting to receive feedback for their work. I found that users enjoyed collaborating with other writers because it gave them motivation to finish their work, inspiration to jumpstart new ideas and direction for their writing process. I also found users tended to only give feedback to their friends and people they respect. Not everyone received the feedback they wanted and needed. 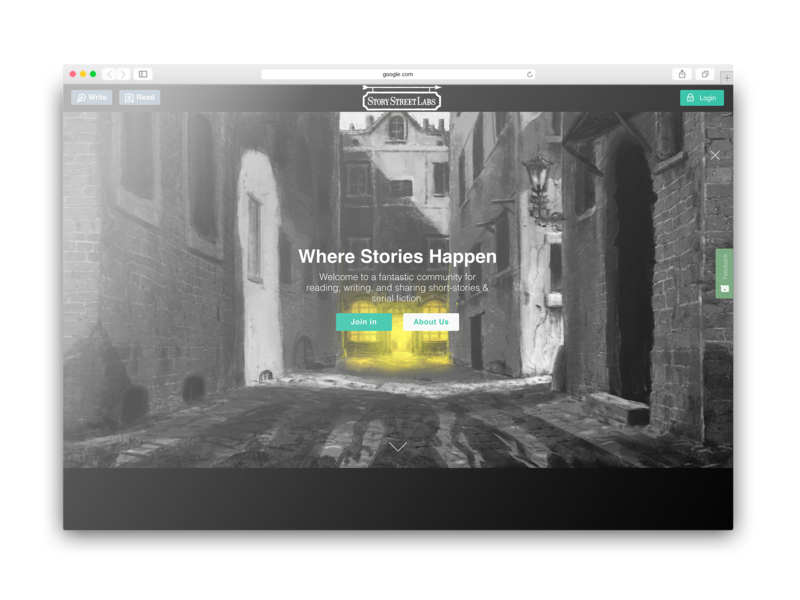 By adding value to these two areas of the site, users would be able to see how Story Street Labs could benefit them. At this point, it was clear users wanted ways to improve their writing experience. Our original task was to bring value to the writing process and increase overall engagement of the site. So we formulated the problem as we had come to understand it through our research. Writing enthusiasts envision the ideal writing community as one that encourages writers to collaborate, share their work and incentivizes each other to give specific, actionable feedback. 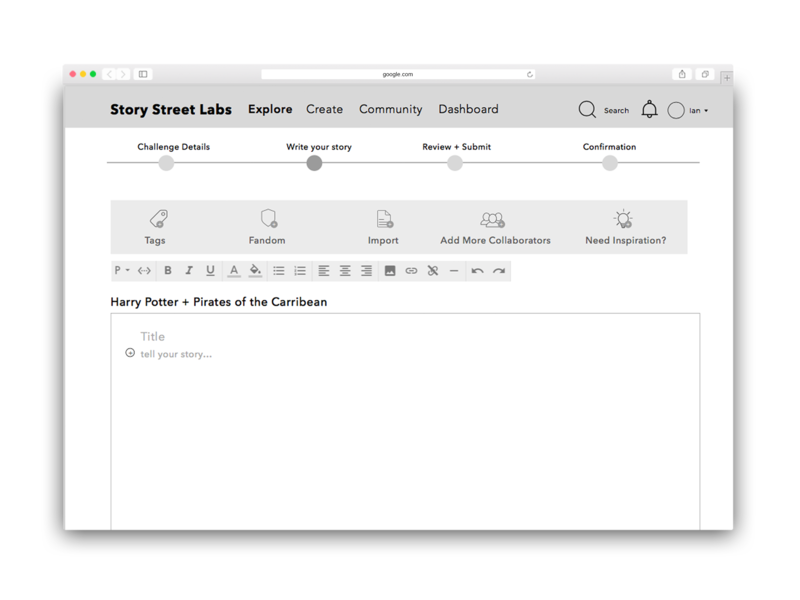 To achieve this, we needed to find a way to adapt Story Street Labs to develop and maintain such a community, so users are able to improve their writing process. Now that we had a clearer view of the problem writers faced, I created four design guidelines to help influence our design decisions to make a product that was encouraging, engaging and easy to use. Provide tools and resources to help writers improve their writing process. We were ready to jump into exploring possible features to help our users improve their writing process. 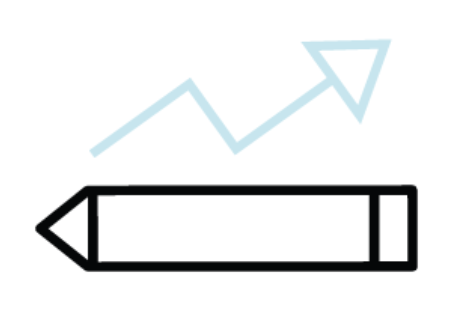 With so many of our insights centered around the idea of finding ways to improve the writing experience through community and feedback, we decided to look closely at two ways of achieving this: motivation and engagement. After we brainstormed our ideas on a whiteboard, we came up with three different ways to approach solving for the problem. Through initial research, we discovered users were frustrated with certain usability issues on the site. As a result, we strategically decided to diverge in layout, interaction and flow so that we could test different versions. Since we knew Story Street Labs’ main competitors had an established and active community, we revisited our competitive analysis. We looked to Wattpad and Archive of our Own to find gaps and try to turn those gaps into opportunities for us. We also looked at our indirect competitors for new opportunities to leverage and took a lot of inspiration from existing interactions and design patterns. This explored increasing visibility of the content on the homepage and features of the writing page such as asking for inspiration and requesting specific feedback. This concept explored incentivizing users to give specific actionable feedback through a karma points system. 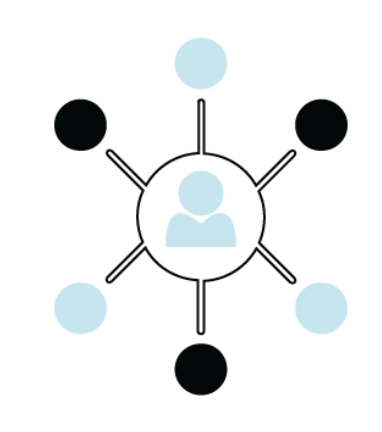 I explored this concept to further validate if users wanted to collaborate with others and tested various features of the community section of the website. Would they use the concept on a weekly basis? Would the new features encourage them to use Story Street Lab’s site over others? Users liked the option to request feedback on the challenge entry. Users thought down voting may discourage writers. More users were likely to explore creative challenges when they saw it on the homepage. 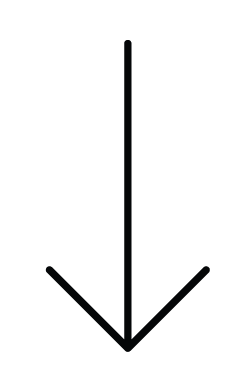 Users liked the idea of points but wanted it to be less competitive. 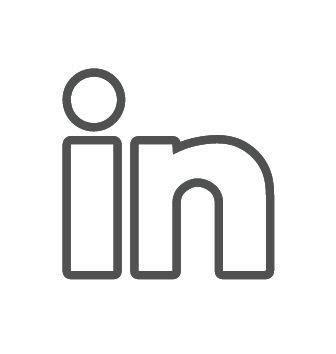 Users thought the integrated profile was a good way to connect with other writers. Specific actionable feedback is very important to writers. Moving forward, we decided to take all the positive points of feedback and combine the three concepts into one converged product. 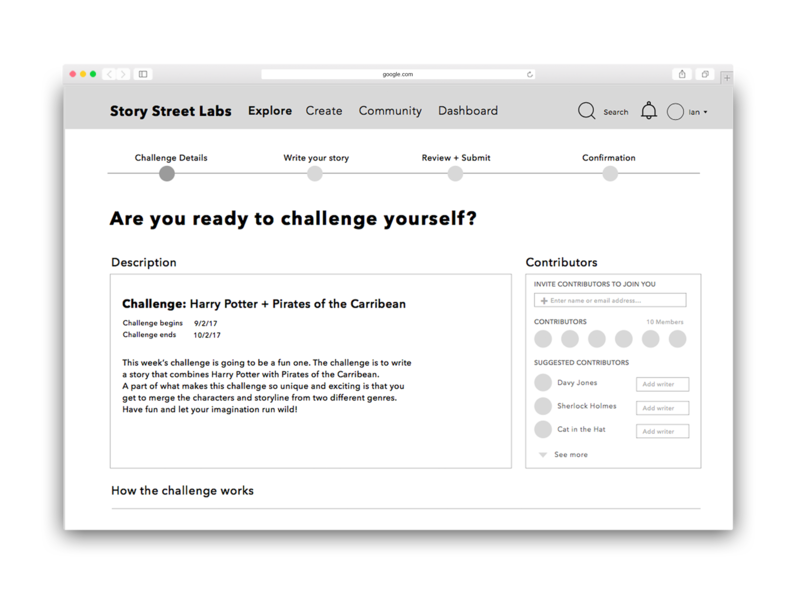 We envisioned the new Story Street Labs to be an online community that encourages users to improve their writing process by offering them the tools and resources to stay motivated and engaged. Users are able to read about how the challenge works, add contributors and view past contributions. Users enjoyed the option to collaborate with other users on the site. They appreciated the amount of detail for the challenge description but wanted the option to choose different time frames for a challenge. They also wanted to know if there was a reward for winning the challenge and how the winner is picked. Users have the option to add elements to their story such as tags and fandoms. They are able to request inspiration in case they have a writer's block. 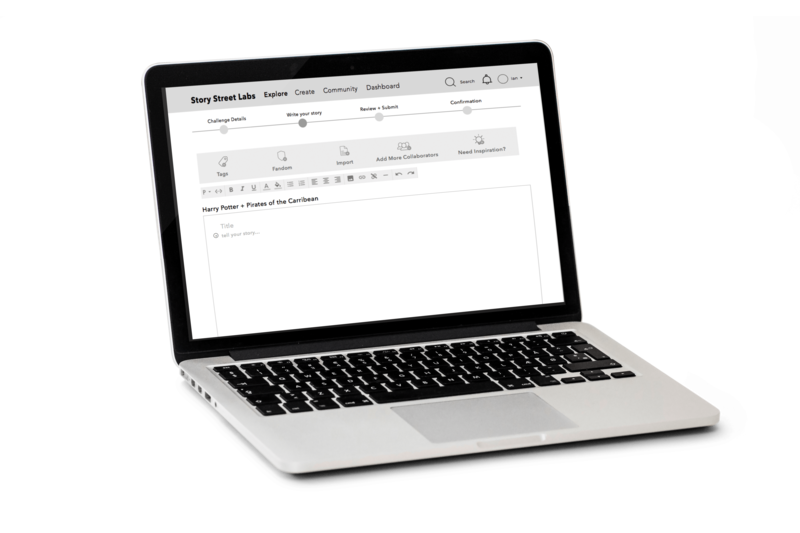 Users appreciated the amount of detail and tools offered on this page but voiced that the setup might not be helpful for all writers, particularly more professional writers. Users also could envision themselves using the new feedback feature because it allowed them to request specific, actionable feedback. 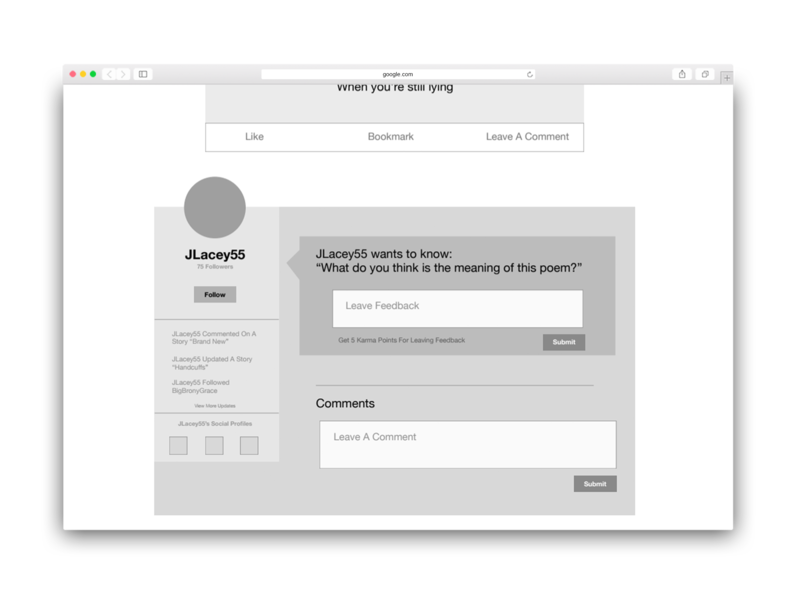 Users are able to leave a comment or give feedback on a writer's work. 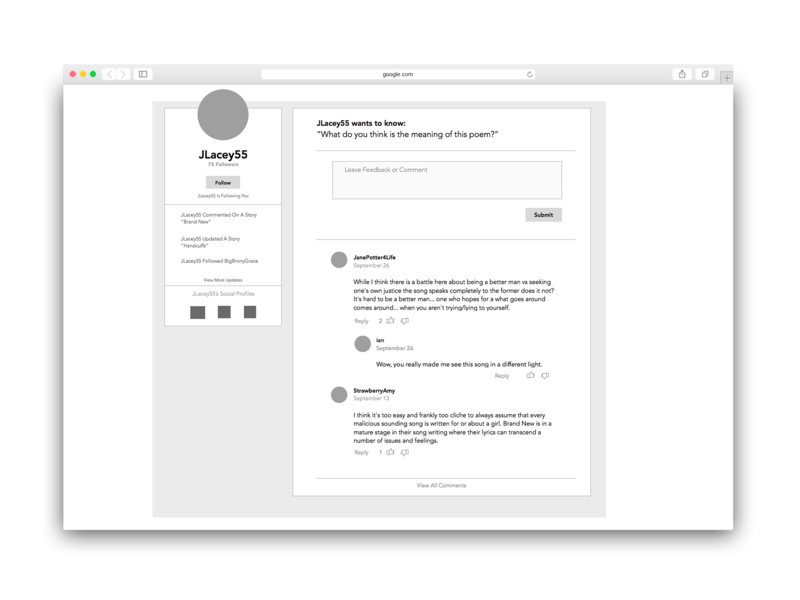 While users enjoyed having the action to get specifc feedback on their work, they were confused on the difference between comments and feedback. 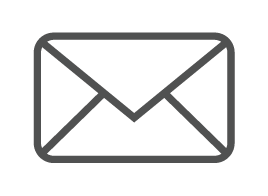 They noted that it seemed like feedback and comments were interchangeable features. After testing this flow, we returned back to our client’s assumption to see if we could validate them as well. We confirmed that users do want to improve their writing with actionable feedback and the key to get users to give feedback is through motivation and recognition. At the end of the three weeks, we presented all of our final testing results and prototype to our client. He was pleased with the results and appreciated that we circled back to his initial assumptions and validated most of them. He acknowledged that we were given a difficult task but commended us for being proactive and positive throughout the entire process. In order to better facilitate a community of writers and to provide a set of specific features and content, we recommended revisiting the target groups to gain a deeper understanding of the target audience age range and specific content preferences. We also suggested concentrating on either amateur writers or professional writers, and not both. We believe the current site is not setup to accommodate both audiences. 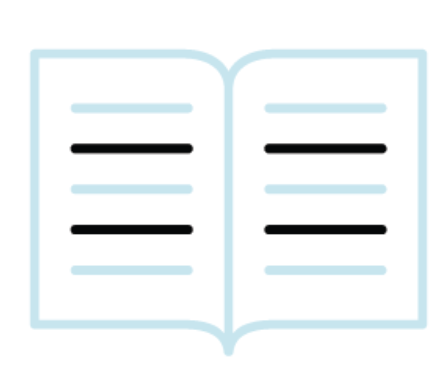 Our research revealed that users valued receiving specific feedback on their writing. The testing of this feature was limited to one iteration, which consisted of separating feedback and comments. 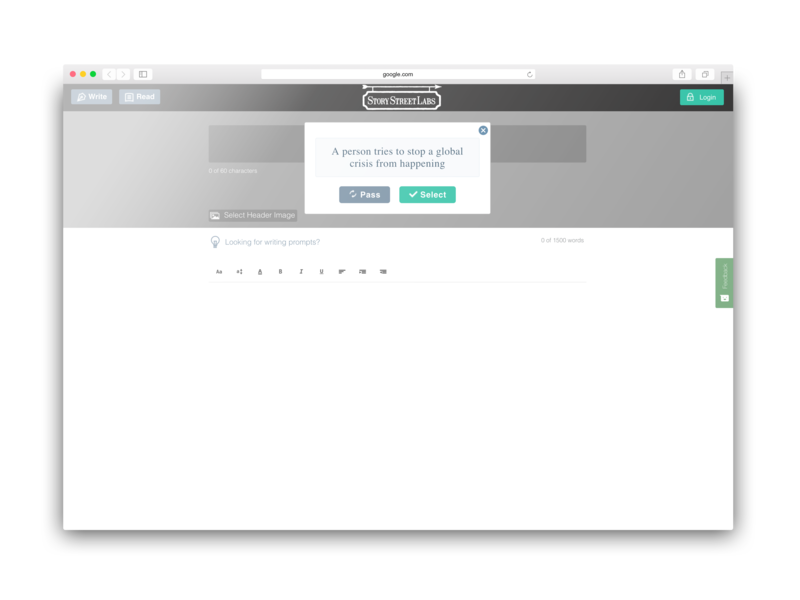 Responses for this feature were mixed, with some users expressing that feedback and comments have the same meaning, while others said they wouldn’t engage without receiving a benefit in return. We recommended our client further explore how feedback can be implemented throughout the site, since the idea has been validated through research. 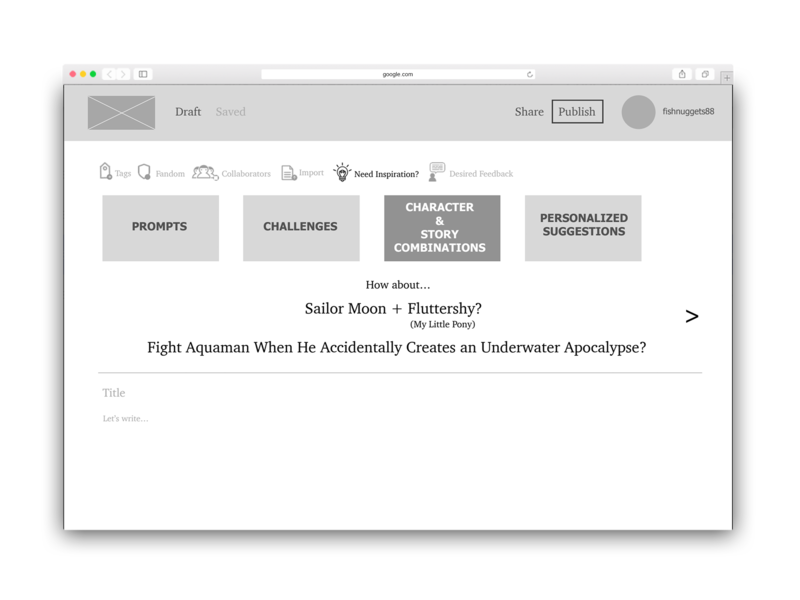 This project introduced users to a different way of accessing writing prompts as well as tools such as challenges and character combination suggestions in the writing platform. Users responded positively to both features. However, testing was again limited to one iteration so we suggested further testing writing prompts and tools as a form of writer motivation and inspiration. Overall, this project was highly ambiguous and conceptual. Although we were faced with many challenges and obstacles, we were proactive in finding ways to overcome them. We were completely game to focus on what we had control over and to be okay with things we didn’t. Validating client’s assumptions is ok. You don’t have to reinvent the wheel. In the beginning of the project, I was skeptical about presenting our insights to our client because we didn’t have something completely new to tell him from our research. I realized I was worrying for nothing. Our client was actually pleased that we were able to validate some of his initial assumptions and confirm his site was on track for success. We continuously scoped what we couldn’t address. We had a lot of different focuses arise in this project and we needed to regroup a number of times. After discovering we were not on the same page in the beginning of the project, I made it a point to always check in with each other to make sure we were moving forward in the same direction.